My newly acquired sensitive skin is a real pain is the a**! Most skincare brands that I was completely fine with, no longer suit my skin and make me break out. It doesn’t really help when I have to review products, but hey, it’s all about experimenting and being careful right? 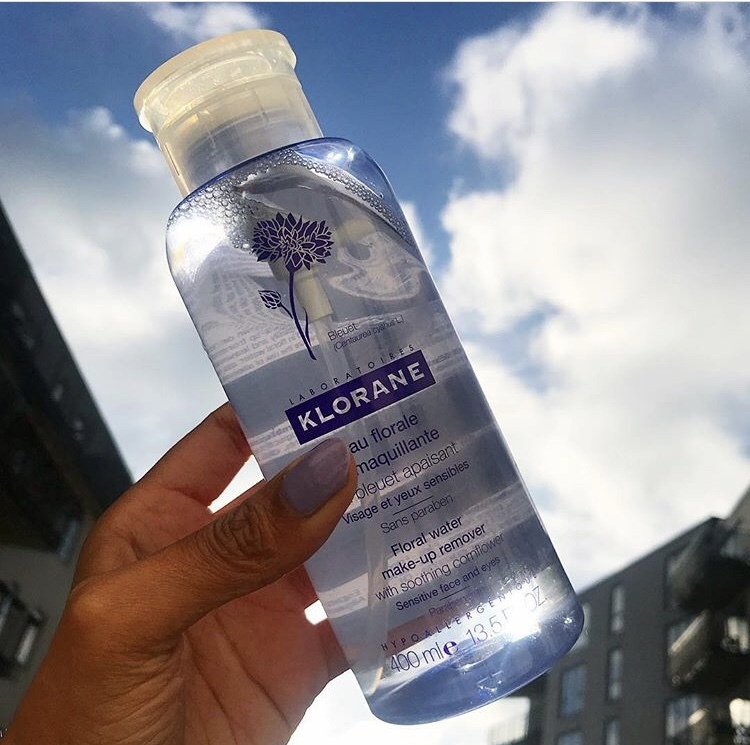 As a new fan of French Pharmacy brands…yes it’s a thing…and they are very good… I recently discovered Klorane. You might know them for their iconic dry shampoo, but I really think their best product has got to be the Soothing make-up remover with soothing Cornflower. This makeup remover has been specially formulated for people who wear contact lenses and have sensitive skin. The cornflower has been organically cultivated and it contains no parabens so its delicate enough to remove all traces of make-up from the face, lips and eyes, leaving skin cleansed, moisturized and soft to the touch. I normally wash my face first and then use this to remove the excess makeup, or sometimes the other way round. I don’t really let any removers, micellar water and cleansing balms, unless their organic touch my face or else my skin reacts, however, this micellar water is so gentle, it removes my skin without stripping it or irritating my eyes. The bottle is huge, I started using it in February and still have 1/4 of the bottle left which is amazing because I use a LOT. There’s also a cute pump that you push with a pad which dispenses the perfect amount of product. I love it so much I might have to take a trip to Paris to buy a new one.